This post is part of the Food and Mood series. I am excited to welcome guest author, Rachael Teufel – cake artist extraordinaire. Welcome, Rachael! Thanksgiving is one of my favorite holidays. While there may be a little fuss with putting together a great meal, there’s no gifts to buy, cards to send, or candy laying around. It’s simply about spending time with family and giving thanks to all the wonderful people we love. Sadly, it’s not always possible to travel to be with family, so I have to bring our family to us in other ways. 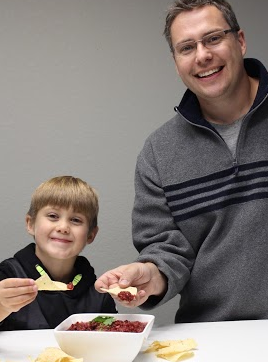 Making recipes that I would typically enjoy with them helps make me feel like I’m home for the holidays. 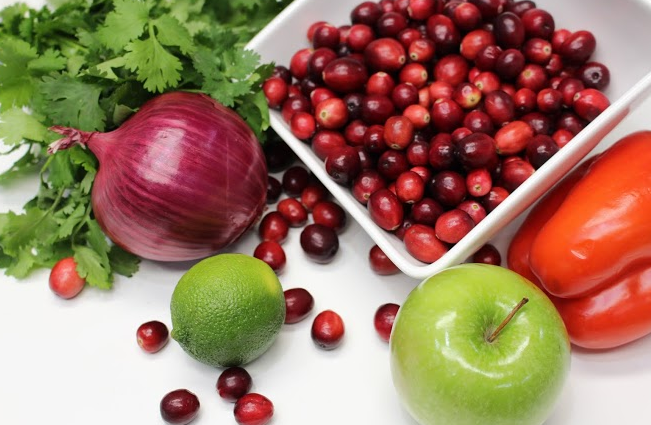 I thought I’d share one of my favorite holiday appetizers compliments of my Aunt Laura, fresh Cranberry Salsa. 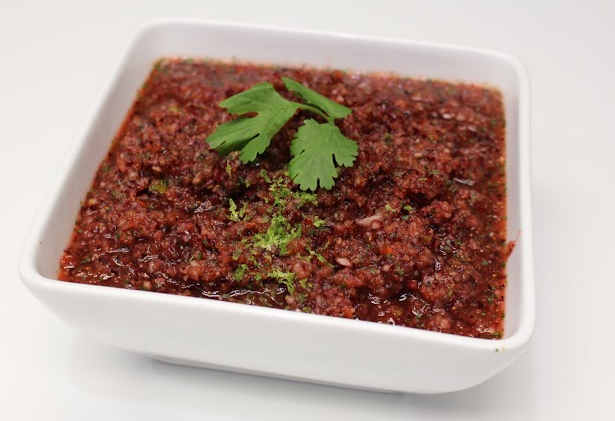 This is one of the most delicious salsas you’ll ever eat! It’s packed full of fresh fruits and vegetables and has a sweet, yet tangy flavor. Place all ingredients into a large food processor and pulse until desired consistency is reached. Serve with tortilla chips. 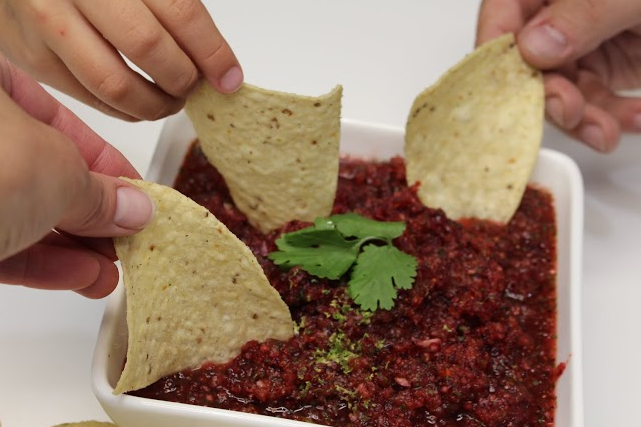 The lime tortilla chips go great with this salsa adding a little more zing to each bite. Rachael Teufel grew up baking in the kitchen with her Hungarian grandmother, but she didn’t discover her passion for cake decorating until later in life while seeking a creative outlet from her day job. She always had artistic interests, so cake decorating seemed like the perfect activity after a long day working as a Physical Therapist. 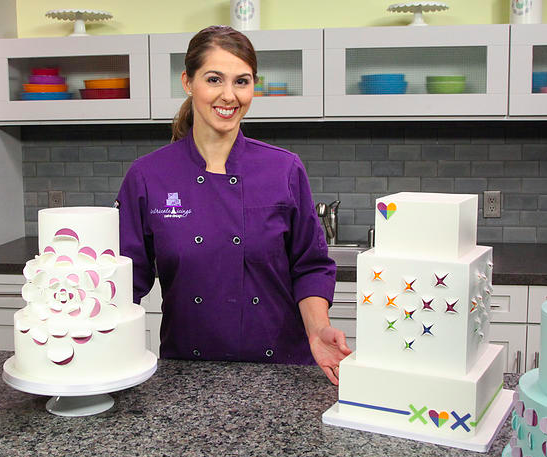 Rachael began her passion for cake decorating in 2001 with a few Wilton classes and continued to educate herself by taking classes with top designers like Ron Ben-Israel, Colette Peters, and Marina Sousa. In 2006, she started her own company, Intricate Icings Cake Design, out of a commissary kitchen and eventually opened her own studio in 2009. After 6 years in her studio, Rachael opted to scale back her company to focus solely on custom designed, luxury wedding and event cakes, while continuing to share her cake knowledge in private classes and through online Craftsy classes. Rachael’s work is now nationally recognized in both the wedding industry and the cake decorating community. Her work can be seen on episodes of Food Network Challenge as well as in the pages of magazines such as Brides, Martha Stewart Weddings, and The Knot. Rachael has been awarded several top honors including being named one of Martha Stewart Weddings’ top pastry pros in the country and Brides Magazine’s “Top 100 Bakeries”. Brides Magazine has also featured Rachael’s cakes in the “50 Most Beautiful Wedding Cakes” and “America’s Prettiest Wedding Cakes”.